When Luke and I interviewed for the Executive Director position at Shalom Hill Farm, our interview began with a moment of silence where we were all invited to breathe and center ourselves. 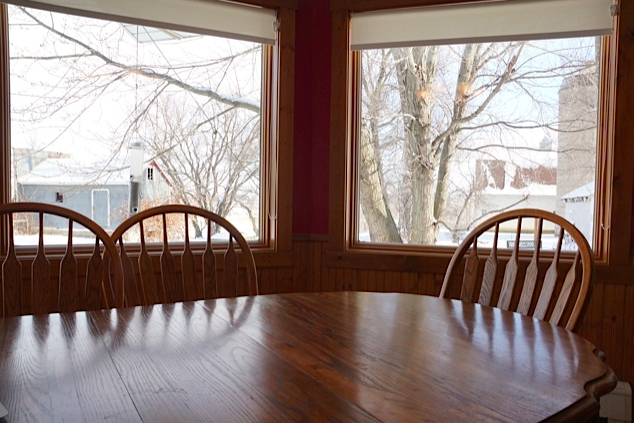 I closed my eyes and thought, “This may be the only time I ever sit at this table and take in this view, or this may be the first of many memories I will make in this space.” And then I prayed that God would make clear the decision on both sides. Our interview was life giving and emotional. The more people shared about the mission, vision and history of Shalom Hill Farm, the more connected we felt to this place and the people who care for it. It was no doubt one of the most important interviews of our lives; still we were relaxed and confident because we trusted the search committee and their process. All of us were discerning in our own ways as to what God was encouraging us to do next. As I write this, I am sitting in the same place I sat for our interview. Luke, Adie and I have been here for just over 2 months and this kitchen where we discerned our call has become our home. As I look out at this spectacular view I am excited for the work we have ahead, ensuring that Shalom Hill Farm continues to be a place where people feel graciously welcomed and are able to rest, retreat and learn. I welcome you to connect with us to visit the farm and find out what God is up to in this place. Shalom Hill is a very special place. I know that you are going to love being there. Thank you! It truly is.